This is the real deal, straight up, straight ahed bluegrass. played with energy and passion by men whoâ€™ve been working together for years. Lead singer and band leader Danny Paisley is the Pennsylvania born son of Blue Ridge North Carolina parents who moved to the big northern city in search of a better life. They brought their music with them and passed it along to sons Danny and Michael. The brothers played in several bands and joined their father, Bob Paisley, in Southern Grass in 1979. TJ and Bobby Lundy, sons of a fellow bluegrass musician and former band mate of Bob Paisley, found their way to the band as well. Perhaps there was some generational karma working when Don Eldreth, Junior, whose Dad was a well known mandolin player whoâ€™d also played with the elder Paisley and Lundy, also found his way to the group. Whatever it was, it made for a tight sound, and a tight family band feeling. That gave Danny Paisley to strength to step up and take the lead and continue the band when his father passed away in 2004. It turned out to be a way to honor the older musicians in their families, as the new generation dug deeper into the mountain sound and sought out more recording and touring opportunities. Whatâ€™s apparent on this recording is that they really know their stuff, from mandolin chops to lead singing to high and low harmonies, to fiddle, banjo, guitar, and bass. .Though they are rock solid in bluegrass history and the sound is very traditional, they donâ€™t limit themselves by that: rather they work within the sound to bring a sturdy and fresh sound to newer songs as well as familiar ones. A couple of barn burning instrumentals show that the men can hold their own with no words spoken or sung, too. Josh Daniels joins for fine lead guitar on several tracks, including the fast paced Blue Ridge mountain refugee song Iâ€™m Leaving Detroit, which will have you tapping your foot is not singing along. Sweet Potato Rag is one of those fiery instrumentals, and country tune smith Harlan Howardâ€™s classic Another Bridge to Burn gets a fine reworking in the high lonesome sound. Raisinâ€™ Cane in Texas and Drowning Sailor are two other tracks to watch out for. Itâ€™s all worth your listening. Crisp playing, fine bluegrass style singing, and a good selection of tunes find Danny Paisley and the Southern Grass keepinâ€™ on keepinâ€™ on in honoring and sharing the tradition they love. The current line up of Southern Grass includes Danny Paisley on lead and tenor vocals, and guitar, Michael Paisley on bass, TJ Lundy on fiddle, Bob Lundy on banjo and baritone vocal, and Donnie Eldreth, Junior, on mandolin and lead and tenor vocals. 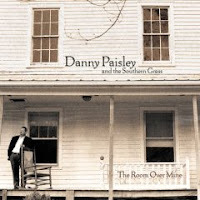 No user commented in " CD Review: Danny Paisley & the Southern Grass: The Room Over Mine "